Okanagan Lake winds between Kelowna (foreground) and Westbank (background). Okanagan Lake is a large, deep lake in the Okanagan Valley of British Columbia, Canada. The lake is 135 km (84 mi) long, between 4 and 5 km (2.5 and 3.1 mi) wide, and has a surface area of 348 km2. Okanagan Lake is called a fjord lake as it has been carved out by repeated glaciations. Although the lake contains numerous lacustrine terraces, it is not uncommon for the lake to be 100 m deep only 10 m offshore. Major inflows include Mission, Vernon, Trout, Penticton, Equesis, Kelowna, Peachland and Powers Creeks. The lake is drained by the Okanagan River, which exits the lake's south end via a canal through the city of Penticton to Skaha Lake, whence the river continues southwards into the rest of the South Okanagan and through Okanogan County, Washington to its confluence with the Columbia. The lake's maximum depth is 232 metres (761 ft) near Grant Island (Nahun Weenox). There is one other island known as Rattlesnake Island, much farther south by Squally Point. Some areas of the lake have up to 750 metres (2,460 ft) of glacial and post-glacial sediment fill which were deposited during the Pleistocene Epoch. Notable features of the Okanagan Valley include terraces which were formed due to the periodic lowering of the lake's predecessor, glacial Lake Penticton. These terraces are now used extensively for agriculture such as fruit cultivation. Cities bordering the lake include Vernon in the north, Penticton in the south, and Kelowna, as well as the municipalities of Lake Country (north of Kelowna), West Kelowna (west of Kelowna), Peachland (south of West Kelowna), and Summerland (north-west of Penticton). Unincorporated communities include Naramata (north-east of Penticton). Various lake features include Rattlesnake Island (a small island east of Peachland), Squally Point (a popular cliff-diving area) & Fintry Delta on the west side. The five-lane William R. Bennett Bridge, a floating bridge with a high boat passage arch connects Kelowna to the city of West Kelowna and the community of Westbank. This bridge replaced the three-lane floating Okanagan Lake Bridge on May 30, 2008, which had a lift span for passage of large boats. During the early days of settlement and development of the Okanagan region, the lack of roads in the region made the lake a natural corridor for passenger travel and freight. The Canadian Pacific Railway Lake and River Service was the main carrier on the lakes, providing freight and passenger connections between Penticton, on the Kettle Valley Railway (the Southern Mainline) and Okanagan Landing (Vernon) for connections to the CPR Mainline at Sicamous via the Shuswap and Okanagan Railway. Smaller vessels such as the SS Naramata provided passenger service to smaller settlements around the lake, as well as excursions for tourists. Many parks and beaches are found along the shores of the lake, which make boating and swimming very popular activities. The lake is home to several species of fish, including rainbow trout and kokanee. It is said by some to be home to its own lake monster – a giant serpent-like creature named Ogopogo. 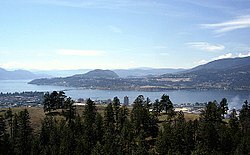 Wikimedia Commons has media related to Okanagan Lake. ^ "Okanagan Lake". BC Geographical Names. ^ Limnology of the Major Lakes in the Okanagan Basin. Canada - British Columbia Okanagan Basin Agreement, Final Report, Technical Supplement V. (PDF) (Report). Penticton, British Columbia: British Columbia Water Resources Service. April 1974. p. 46. Retrieved 2015-10-22. Okanagan Lake surface area: 348 * 106 m2. Dat compiled by the charts of the Fish and Wildlife Branch, Department of Recreation and Conservation, BC. ^ Stockner J.G. ; Northcote T.G. (1974). "Recent limnological studies of Okanagan Basin lakes and their contribution to comprehensive water resource planning". Journal of the Fisheries Research Board of Canada. 31: 955–976. doi:10.1139/f74-111. ^ "Okanagan Lake". World Lakes Database. International Lake Environment Committee Foundation. Archived from the original on 2005-11-21. Retrieved 2006-05-12. ^ Murray A., Roed (1995). "Chapter 5: The ice Age in the Okanagan". In Roed, Murray A. (ed.). Okanagan Geology: British Columbia. Okanagan Geology Committee. p. 48. ISBN 978-0-9699795-4-8. ^ Penticton Museum displays, and heritage signs at the Okanagan Lake Heritage Shipyard on Okanagan Beach in Penticton. This page was last edited on 16 November 2018, at 05:07 (UTC).